Hanna is quick to point the finger at Aria when she realizes that Aria snuck out of the hotel the night of Charlotte's murder. 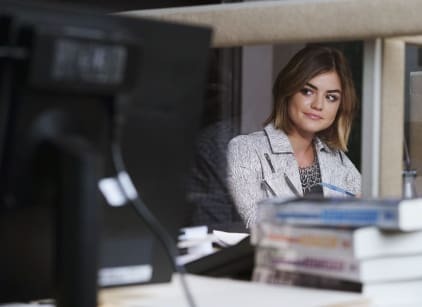 Aria tries to lie to her, but Hanna tells her she knows she was out for longer than a few minutes, but Aria maintains that it was just a few minutes, before leaving to go back to Boston to work. We meet her boyfriend Liam, and her boss. Her boss is not impressed that Ezra doesn't want to go forward with his second book and sets Liam on the case to secure his second book, but Aria is scared he finds out stuff about her and tries to get Ezra to do the book. When she meets him, she gets him to promise not to tell anyone what they did that night. When Aria is back in town, the girls pull her up because they see her meeting Ezra in the security footage and she comes clean about what happened that night. She says they went out for pizza, but when they lay eyes on Charlotte, Ezra goes weird and sends her in a cab back to the hotel, so the liars aren't sure what he did. Aria asks Hanna to get rid of the video, to which she reluctantly agrees. Ali throws a dinner party and invites the liars, but she isn't impressed that Aria is dodging her calls and says something at dinner that makes the liars realize she knows they're hiding something. She found out that Charlotte died at 4am, around the same time Aria met Ezra at the hotel. She goes to Lorenzo and says she believes that her friends played a part in the murder. Caleb is working for Veronica on her campaign and he and Spencer are pretty close. He meets Jordan for the first time and dinner and he compliments him to Hanna, saying that he seems like a nice guy. Emily goes to give blood and runs into the owner of the brew when her card gets declined for parking. The chick saw she came from the medical center and informs her that if she's going through something she will need a friend. Emily brushes her off, but when her mother notices her calendar in her phone, she makes up a huge lie to deflect why she was there in the first place. She goes to her dad's funeral and lets all her feelings out, but she is shocked to see Sara there and runs off.